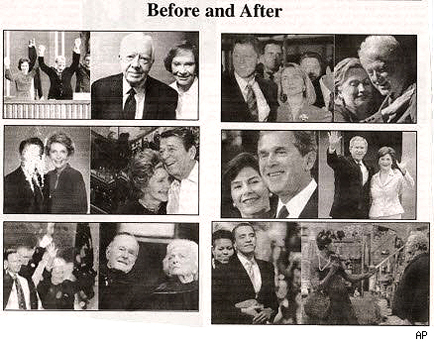 New York's Long Island weekly newspaper, Smithtown Messenger, published a photo spread entitled "Before and After" of the past five presidential couples and the Obamas at the beginning and end of their respective presidential terms. The piece would've been clever had not the paper chosen to depict the Obamas "after" as Esther (LaWanda Pages) and Fred Sanford (Redd Foxx) from the early 1970s sitcom Sanford and Son. After accusations of racism, publisher Phillip Sciarello defended the piece as satire but said the newspaper would run a retraction in its next edition. The NAACP's Long Island regional director Tracey Edwards described the piece as "despicable and disrespectful. If this was intended as satire, it misses the mark." Hazel N. Dukes, president of the state NAACP conference said in a statement on Wednesday, "it is simply shocking and outrageous that such a blatantly racist ad would run in any paper, much less an official paper of Suffolk County," Dukes said. "New Yorkers of all races and ethnicity are disgusted by it and reject it." If satire is meant to be witty, even ironic, or at least exaggerate a bit of truth, Blindie thinks that the Smithtown Messenger definitely missed the mark -Esther is not Fred Sanford's wife but his bickering sister-in-law and the only similarities between them and the Obamas is their race. The satire relies upon the stereotype that black people are of a depressed economic class, bicker frequently, and are generally comedic because of that. Much to the chagrin of Republicans and haters everywhere, President Barack Obama was awarded the Nobel Peace Prize on Friday. The Norwegian Nobel Committee praised the President's "efforts to strengthen international diplomacy," his "vision of and work for a world without nuclear weapons" and for inspiring hope and creating "a new climate in international politics." Obama responded to the honor saying he was surprised and deeply humbled. "Let me be clear: I do not view it as a recognition of my own accomplishments, but rather as an affirmation of American leadership on behalf of aspirations held by people in all nations," hesaid. "To be honest, I do not feel that I deserve to be in the company of so many of the transformative figures who've been honored by this prize." And what did all the critics say? "Apparently Nobel Prizes are now being awarded to anyone who is not George Bush," Air America correspondent Ana Marie Cox wrote on Twitter. Washington Post blogger Ezra Klein also commented on Twitter: "Obama also awarded Nobel Prize in chemistry. 'He's just got great chemistry,' says Nobel committee." 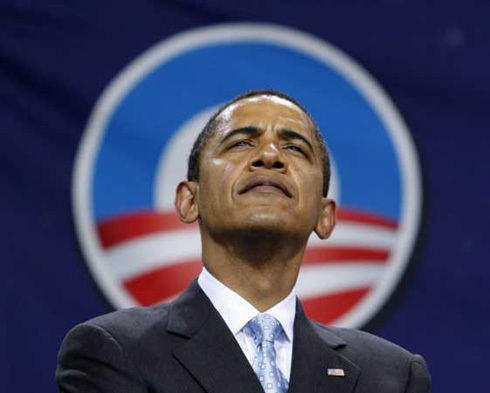 The Daily Beast's Peter Beinart wrote: "I like Barack Obama as much as the next liberal, but this is a farce." And Michael Russnow wrote on the Huffington Post that he too is an Obama supporter but, "Whatever Happened to Awarding for Deeds Actually Done?" horbjoern Jagland, chairman of the Norwegian Nobel Committee, told the AP, "Some people say — and I understand it — 'Isn't it premature? Too early?' Well, I'd say then that it could be too late to respond three years from now," T "It is now that we have the opportunity to respond — all of us." Obama is the third sitting U.S. president to win the award after President Theodore Roosevelt in 1906 and President Woodrow Wilson in 1919. He plans to donate the cash prize of $1.4 million to charity. President Barack Obama delivered a televised speech to school children across the country from the Wakefield High School in Arlington, Virginia on Monday amidst controversy and protests. Even though other presidents have delivered back-to-school addresses, Obama's speech was met with harsh criticism as some accuse him of trying to push his agenda directly to children. Before his speech, the President met with a group of Wakefield students for an informal discussion where he warned the high-schoolers of the perils of posting on Facebook saying, "be careful what you post on Facebook. Whatever you do, it will be pulled up later in your life." Obama stressed the importance of taking responsibility and committing to succeed during his speech and said, "At the end of the day, the circumstances of your life, what you look like, where you come from, how much money you have, what you have going on at home, none of that is an excuse for neglecting your homework or having a bad attitude in school. "There is no excuse for not trying. Where you are right now doesn't have to determine where you'll end up. No one's written your destiny for you because here in America you write your own destiny. You make your own future."